being MVP: Manhattan Toy: Motorworks & Giveaway! 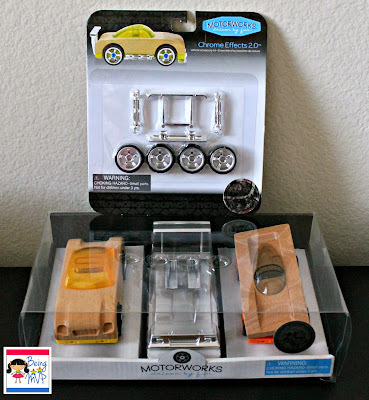 Manhattan Toy: Motorworks & Giveaway! Kenzie has been thoroughly enjoying her Motorworks wooden cars and was excited to add to her collection when several more arrived for review. 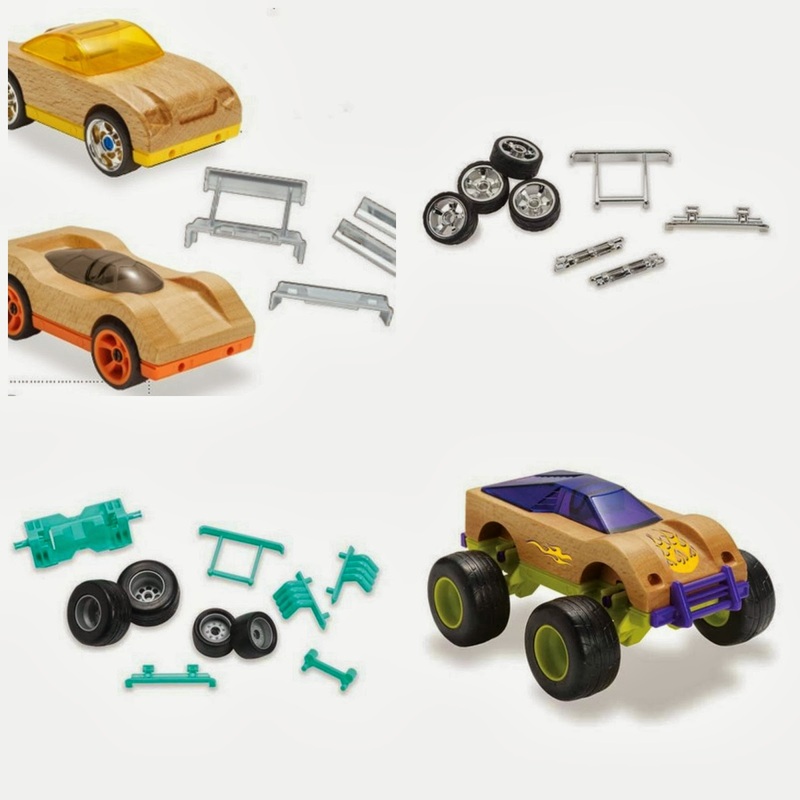 What's neat about the Motorworks collection is that the accessory kits are interchangeable with all the vehicles! 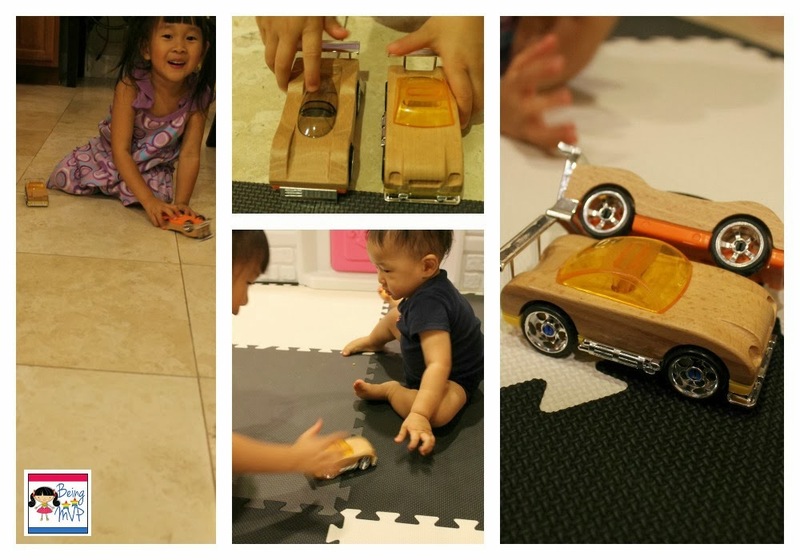 The Motorworks Race Pace Power Pack 2.0 comes with two wooden vehicles with basic accessories. Kenzie immediately knew what to do with her new cars and went to work on customizing. She likes the shiny, fast cars already. She wanted to open the Chrome Effects 2.0 Accessory Kit to fancy up her vehicles and went to popping off wheels but asked me for help with the side pipes as they needed a bit more push to pop onto the cars. After fully assembled, Mason joined in on the fun and wanted to play. She is definitely and expert and was even showing Mason how to assemble although he, of course, did not understand fully. She was then ready to get her race on and started zooming the Motorworks Wooden Race Cars all over the house. They go pretty fast and smooth on our tile. Sometimes they flip and Mason goes chasing after them, only to be beaten to it by Kenzie. These cars are well made and provide loads for fun to young toddlers and up. You can start your collection slowly and add on as a special gift. They even have a garage for all your Motorworks vehicles and a tuner lift station that you can place your car in when changing out wheels and accessories. How amazing is this line for little girls and boys alike? Buy It: You can purchase the Race Pace Power Pack 2.0 for $30 and Chrome Effects 2.0 Accessory Kit for $12. Make sure to connect with Manhattan Toy on Facebook and Twitter! One Winner will Receive Choice of Race Pace Power Pack 2.0 or the EXX Atomic Rider 2.0 plus either the Chrome Effects 2.0 Accessory Kit or the Top Fuel 2.0 Accessory Kit! I like the FX Fire Truck 1.0! Motorworks EXX Atomic Rider 2.0 is awesome. He would like the Stealth Police Cruiser. I like their Motorworks EXX Atomic Rider 2.0! Thanks so much for the fantastic giveaway! I think the Motorworks EXX Atomic Rider 2.0 is really cool! I like the GT road racer 1.0- it is so cool! I am excited about the FSS Flareside 1.0 Truck. I like the MOTORWORKS FSX Monster Truck 1.0. I like the FX Fire Truck 1.0. I'm excited about the Motorworks EXX Atomic Rider 2.0. Well I know my son would be excited about the Stealth Police Cruiser! Definitely the FSX Monster Truck!!!! The MOTORWORKS FX Tuner Wagon 1.0! I like the MOTORWORKS EXS Ground Effects Roadster 1.0. Thanks for the chance to win! My grandson would like the MOTORWORKS TPP Sport Truck Power Pack 1.0.